Striped Heart Baby Afghan Square Crocheted Using Bernat Softee Baby Yarns. Photo © Amy Solovay, Licensed to About.com, Inc. 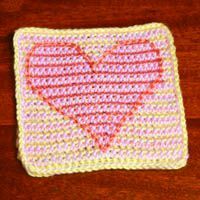 If you would like to create a soft, warm baby afghan, you might enjoy this free crochet pattern for a striped heart baby afghan square. Work multiple squares using single crochet stitch and the tapestry crochet technique. Then combine the squares to create your baby afghan. We've provided a free charted design with striped heart motif, as well as the free crochet pattern. You supply the creativity! Although the square is worked in lightweight baby yarns, you’ll end up with an afghan block that is delightfully thick and warm; yarns carried throughout the design add to the weight of each square. For each baby afghan square, you’ll need three different colors of lightweight yarn. The yarn I used to make the sample is rated as a 3 on the yarn weight system used by the Craft Yarn Council. This is also known as "double knitting" weight or "light worsted" weight. You can see pictures of many more color ideas for this pattern. Feel free to substitute yarns. I / 9 / 5.50 mm crochet hook, or size needed to obtain gauge. Each finished baby afghan block measures approximately 6.5 inches square, including the edging. Without the edging, the block measures approximately 6.25 inches. 4 stitches and 4 rows = 1 inch. Gauge isn't too critical for success with this project; an afghan square is going to be usable no matter what size it turns out. However, it is still a good idea to check your gauge; if your gauge is drastically different, you may want to switch crochet hooks. See this tutorial for how to change colors in single crochet stitch. Keep in mind that your color changes will always take place starting with the last step of the stitch you work BEFORE you want the new color to appear. I created a tutorial illustrating this concept; see my tapestry crochet tutorial for a step-by-step demonstration of how the technique works. This pattern could potentially leave you with a mess of loose ends to weave in, but it won't be so bad if you crochet over the yarn ends as you go. Begin working the striped heart chart. To keep a consistent look throughout the project, you may wish to work overtop of color B and color C starting with row 1. Work in sc, turning your work at the end of every row; use a turning chain of 1 stitch. When you've completed the chart, do not end off; change colors to color B. Round 1: Using color B, work evenly spaced sl sts all the way around the square. At the end of the round, change colors to color A. Round 2: Work through back loops only of the sl sts in the previous rounds. Work 1 sl st in each sl st, all the way around the square. Cut the yarn, leaving a tail of yarn at least 6 inches long for weaving in. Then, remove your hook, and insert it from back to front through the next sl st. Grab the active loop and pull it through the stitch so that it will be on the back of the work. Then end off. Weave in the ends carefully using a tapestry needle. Your work will be visible on the back of the square, so be as neat as you can. To make the heart design stand out more, you may wish to work an outline around it in surface crochet. You can use any color you like. I used color C for the outline in the sample. If you would like to learn about a bunch of different methods for joining afghan squares, visit my list of free tutorials for joining afghan squares. Heart sampler patchwork-style baby afghan: This afghan utilizes the heart square as pictured, plus many other colorways, joined together to create a vibrant and colorful patchwork blanket for baby girls. Coral heart sampler baby afghan: This is another baby blanket idea for little girls.